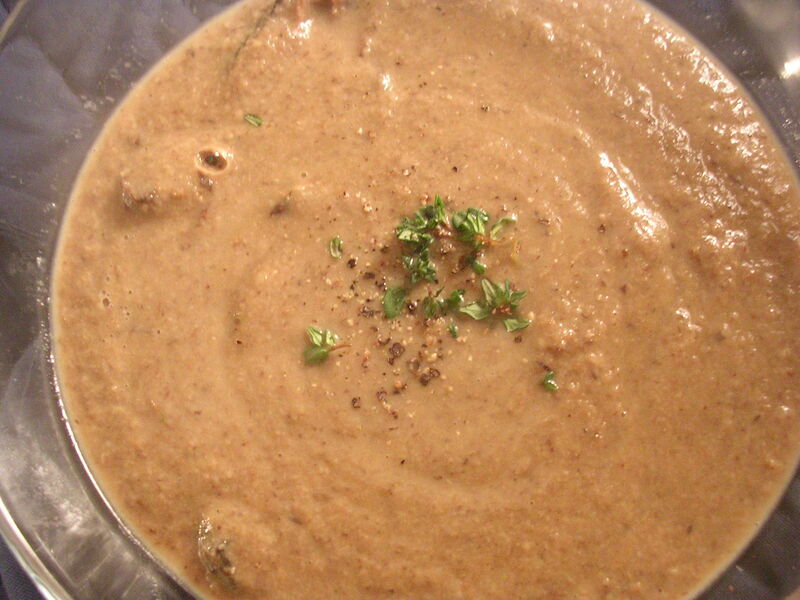 I have tried a variety of mushroom soups. There are the broth style ones that have the mushrooms floating around in them and then there are the cream kind. I have never really found either that appealing. Somehow the broth ones seem light and flavourless and the cream ones taste like someone boiled whipping cream with an onion and salt. The key to a fantastic mushroom soup is the mushrooms of course. You need a lot of these puppies to make them shine in a soup. The other important part is to roast them. Roasting brings out flavour in almost anything and because mushrooms tend to lack a lot of flavour this really helps. This recipe is a stick-to-your-ribs sort of soup that I came up with on a frosty snowy day. If you leave out the creme fraiche it is vegan, but the mushrooms are so meaty you would never guess it. I hope you enjoy it. 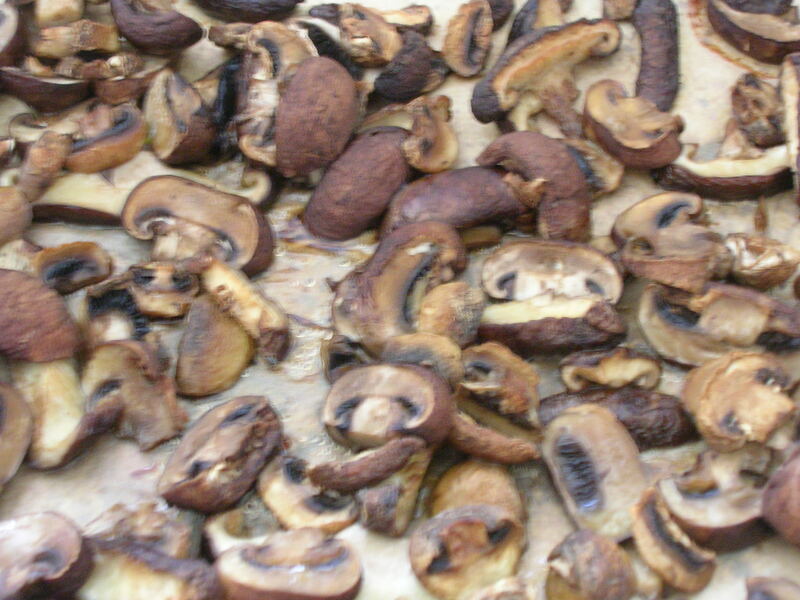 Preheat your oven to 200*C. Scrub your mushrooms so they are free of dirt and remove any tough parts. Cut them up in chunks and toss them in olive oil. Spread them out on a baking sheet. Take the whole head of garlic and lop the top off like a pumpkin. Pour a little olive oil inside and put the top back on. Wrap in foil and place on the sheet with the mushrooms. Put them in the oven and let them roast about 45 minutes, depending on the size of your mushrooms. Stir them once or twice during this time. Once they are done, set them aside in a bowl. Chop up your onion and carrot and heat them in a little olive oil in a big pot. Once they have softened a bit, toss in a few sprigs of fresh thyme and your lentils. Take your head of roasted garlic and squeeze it to release the cloves in the pot. Add 1-1.5 litres of stock and let it simmer about 20-30 minutes. Add 2/3 of your mushrooms to the pot and let simmer another 10 min. Fish out the thyme sprigs. Use an immersion blender to puree the soup or, if you don’t have one, let it cool a little and then puree it in batches in a food processor or blender. If it is too thick, add some more broth at this point. Now add your remaining mushrooms and, if you want, some cream or creme fraiche. I found the soup tasted rich enough without it, but I dropped a little in anyway. Enjoy it with some fresh thyme on top. Trust me, it will make those cold winter days feel far away! Note on Broth: Please make your own. It is super easy and tastes so much better. While I roasted the mushrooms I took a pot filled with water and dumped in two carrots, 1 potatoe, 1 quartered onion, a few smashed cloves of garlic, thyme and a few bay leafs. If you have celery or other root veggies on hand you can toss them in as well. Bring to a boil and let it simmer as long as you can. Strain it and then use it in this recipe or any other soups. Variations: The really important parts here are the roasted mushrooms, broth and thyme. Feel free to play around with the rest. If you have celery or other root veggies you can add those. If you want a lighter soup, leave out the lentils. If anyone experiments with other types of mushrooms or combinations, please share them. 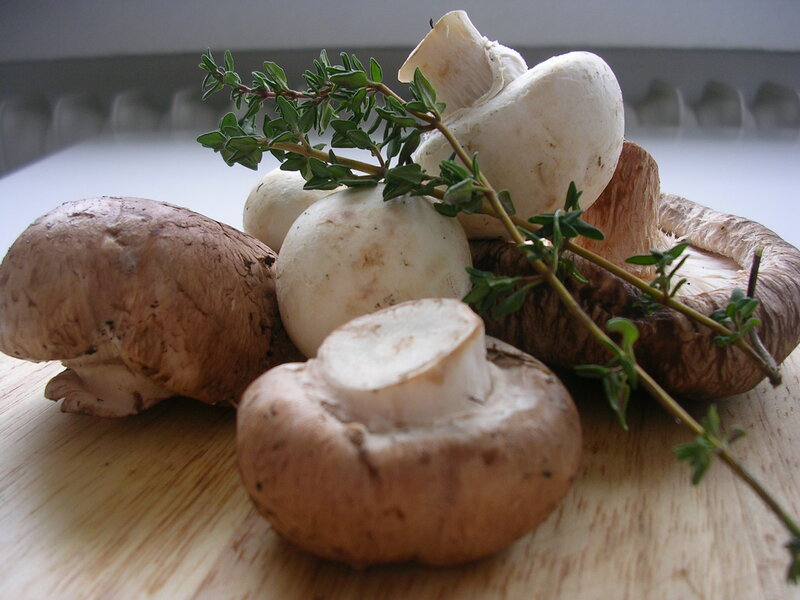 Although I’m not too fond of mushrooms: Your blog title pictures looks really good! I will never buy canned mushroom soup again. This is an awesome recipe and the flavor is out-of-this-world. I guess the roasting does the trick. For Canada, you use 400 degrees F which I thought would be too hot but it worked out fine. My soup came out much darker as I used mostly brown mushrooms. The combination was shiitake (I always mispronounce this), white button, mostly brown crimini and a little mushroom called Enoki. The Enoki got completely lost. Next time I think I might go heavier on the white mushrooms and use a smaller onion. But there will definitely be a next time as this soup is well worth it!!! Thanks Kelly – keep blogging! !